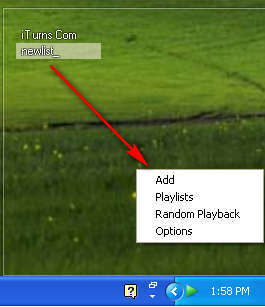 Mcool is a very lightweight music player which also has a very unique user interface. Unlike the majority of popular modern music players, Mcool’s interface is completely transparent with only a very thin white border being visible around it. The application also doesn’t have any menus, which might confuse some users after running Mcool player for the first time. This would be the default window of the application, as you can see we really didn’t exaggerate when we said that the interface is very unique, if you can even see it. Spotting this tiny square might be a problem to those who are running the application for the first time. The fact that there’s a tray icon which you can see helps a lot in determining if the program is actually running or not, so you’ll know at least that :). and a lot more, some of which you probably never even heard of. The main thing that makes Mcool player stand out would be the amount of resources that are used when it plays, but we’ll get to that later. Before songs can be played we first have to figure out how to add songs to the playlist. Since there are no menus, at least no menus in the classical sense, then adding songs to the playlist might be problematic to some, here’s how you do it. Here we can see that there is even an option to play internet radio streams with the help of Mcool, but for now let’s just add a folder to our playlist. Everything works the same like with any other music player, select the folder where your songs are and click on the Add button, or in this case the green check mark. Songs should be listed in the transparent menu right away and you can start playing them by clicking on their names. This would be the right click menu that we mentioned a few lines back. Notice that next to the Add options there are also options for turning playlist on and off. Every folder that you open is considered as a playlist. You can add new ones, or turn them off completely and just look at the full song list. I promised you to say a few words about resources, and here it is, the program only used 3MB of RAM, while being a very small burden on the CPU. 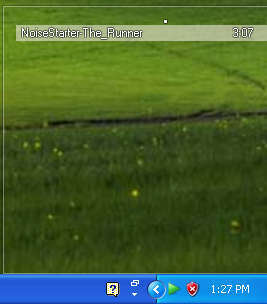 If you have an older PC, then Mcool is definitely the music player for you, free download.